9:31 pm: Couillard comes out strongly as federalist. Work everyday. Referendums are not in my program, they’re in Madame Marois’s program. Worried about keeping jobs in Québec, worried that people can remain in their regions. 9:32 pm: David defends the right of the people of Québec to make their choice. 9:33 pm: Marois: ‘I am not afraid of talking about the future of Québec.’ Accuses Canadian prime minister Stephen Harper of trying to make choices for them. Accuses Couillard of indecision on constitutional issues. 9:33 pm: We don’t have to spend a whole campaign on a referendum. It’s bad for the province. Accuses Couillard of taking about it every day to scare voters. 9:34 pm: Legault asks Marois to be clear — does she plan to introduce a referendum or not? Marois: ‘There will not be a referendum as long as Québeckers aren’t ready.’ PQ won’t do it at night, behind closed doors, so calm down. 9:35 pm: Legault says Marois isn’t answering the question, that she’s being cagey about ‘when Québeckers are ready.’ Says the issue is too important not to be clear. 9:36 pm: Marois repeats the same answer, essentially. 9:37 pm: Marois turns to the Charter of Values — ‘if you want a government that respects your values… you should vote PQ.’ Marois is turning back to a debate on which she believes is stronger territory for her party. 9:38 pm: Couillard argues that Marois is trying to curry favor with voters to talk about this issue — attacks her personally. He says that she could have reached agreement on a Charter if she had agreed to compromise. 9:39 pm: Couillard asks how many women will be fired in hospitals because of the Charter? 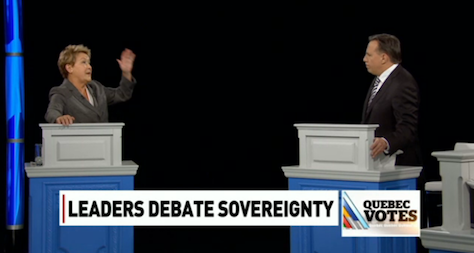 Perhaps the most heated discussion of the debate so far. Marois says that her government would help women ‘adjust’ to the Charter. 9:42 pm: David says QS wants to protect the right of all women to work in Québec. 9:43 pm: Couillard says, ‘I also believe in common values, including individual freedom.’ Couillard adds that it means government has to protect the minority from the majority. A very strong point from Couillard. He may lose points on the issue, but there’s no doubt where he stands — he believes the Charter violates individual freedoms. It’s a clear stand. 9:46 pm: David says the Charter is an election tool for the campaign, says she’s uncomfortable with the PQ strategy. 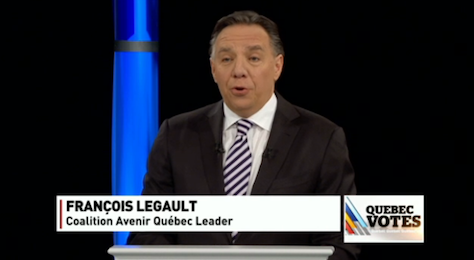 9:47 pm: David and Legault are winning this segment by tag-teaming Marois. Couillard is oddly absent, but I suppose it’s better to let them do his work for him. 9:48 pm: Marois says there won’t be a referendum unless Québeckers want one. Marois asks Couillard if he’s going to sign the Canadian constitution without consulting the Québec people. 9:51 pm: The sovereignty of Québec is a deeply rooted value in the hearts of many people. There are a lot of people who want to fight for a sovereigntist party! Québec solidaire! A strong moment for David, again. 9:52 pm: Legault asks Couillard if he’d let a police officer wear a hijab. Couillard demurs, arguing it will be up to the chief of police. It’s hard to watch this and not think that the entire Charter debate s about Islam and non-Judeo-Christian religion — it reminds me a lot of the debate over eliminating minarets in Switzerland. 9:02 pm: Charbonneau commission’s first mention of the night — staggering, really, given that it was so important to the 2012 provincial election campaign. 9:04 pm: Legault goes, predictably, after the Liberals. But he also goes after Marois’s government for continuing to award shady contract within the province. No doubt about it, Marois is the punching bag of the night, not Couillard. And we’ve not even talked about sovereignty or any referendum! 9:07 pm: Legault attacks Marois on spending $2 billion on publicity, increasing electricity rates, implementing the health care tax. This is all very good news for the Liberals and Couillard. 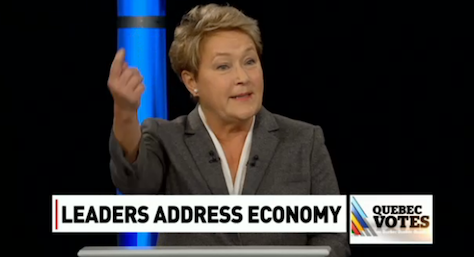 9:08 pm: Again, Marois on the defensive, arguing that her government has reduced the prices of electricity. 9:09 pm: Legault attacks her on both sides — argues that it’s ridiculous that her government buys electricity at 9 cents and sells it at 4 cents, but still attacks her government for increasing rates by 4.3%. 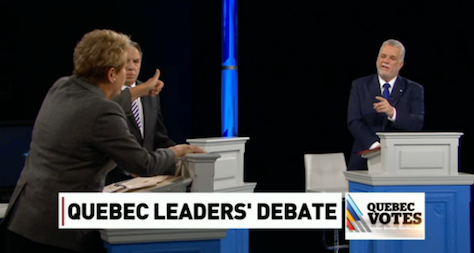 9:13 pm: Marois’s question to David is essentially, ‘It’s the Charest Liberals that are corrupt. Why are you attacking me?’ David argues that the Provincial Assembly passed reforms unanimously. Mentions the Charter of Values for the first time. David says that Marois came to power on a center-left program, but didn’t deliver, that she gave the left hope when she went into the street banging on pots and pans, but let them down in government. A very effective point in the debate for David. 9:15 pm: Again, Marois goes apoplectic about the Charest government and the social crisis it created in trying to raise student fees by 82%. 9:17 pm: David asks Couillard to support a five-year ban on former ministers lobbying the government. Couillard demurs and says, people have to find a job, and that the current two-year limit is sufficient. 9:24 pm: Legault digs in further on Péladeau — selling his shares would seem ‘self-evident’ to Legault. 8:01 pm: So far, I seem to be having a problem loading CTV’s live broadcast. Stand by. 8:06 pm: Back! On CBC now. David is making her opening statement. Looks like we’re going to the first question on the economy. 8:08 pm: David starts talking about public-sector jobs and about a green Québec. 8:09 pm: Legault takes a different tack by emphasizing tax cuts. 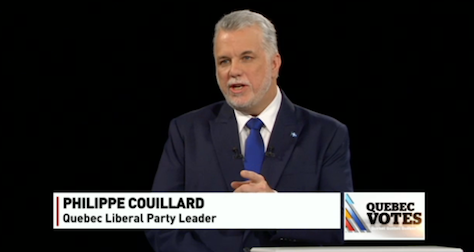 8:10 pm: Couillard emphasizes jobs, tax credits for businesses. ‘Certainly not a referendum on the independence of Québec.’An early jibe at what is now probably Marois’s most glaring liability — and an issue that, essentially, will take up two of the debate’s four segments. 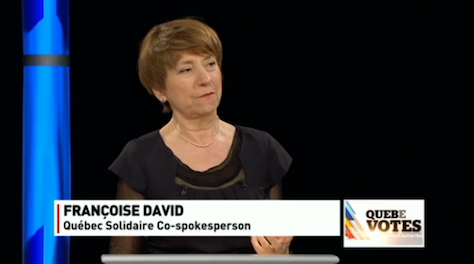 8:11 pm: David attacks Marois for fracking and the environment. Marois changes the topic to hydroelectric power and the Québec’s oil exports. 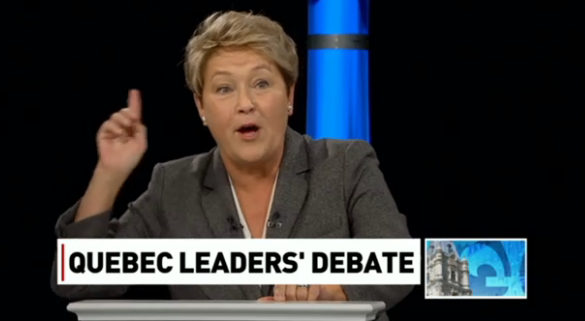 8:14 pm: Marois questions whether Couillard’s team is much different from the Charest team. A back-and-forth over the potential oil deposits on Anticosti Island, north of the Gaspé peninsula. Marois is more aggressive so far than Couillard, but Couillard is holding his own in a calm and collected manner. 8:17 pm: Legault asks David about wind power and subsidies. 8:20 pm: Couillard asks Legault about his support for direct intervention into the provincial economy — taking a shot, perhaps, at Legault’s reputation as the most pro-market of the four leaders. 8:23 pm: Legault attacks Couillard for his private-sector experience: ‘Have you ever created jobs? What you have learned about the economy?’ ‘How many jobs have you created in your life?’ It’s perhaps a sharper exchange than the one between Couillard and Marois — and it’s a clear attempt by Couillard to win over the economically conservative voters that have supported the CAQ (and its predecessors) in the past. 8:26 pm: The debate has turned into whether the PQ minority government has created jobs. Marois argues that the unemployment rate is the same in Québec as Ontario — in fact, as of December 2013, as reported in January, Québec’s rate was actually slightly lower (7.7%) than Ontario’s (7.9%). Legault argues that there have been zero full-time jobs created, whereas Ontario has created 110,000 jobs. 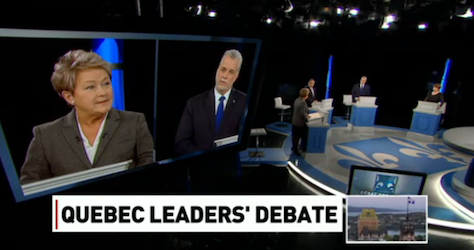 8:31 pm: Couillard and Marois are now trading blows about which party contributed more to Québec’s debt. 8:35 pm: A turn to health care. So far, it’s safe to say that Marois has taken more fire from Couillard and Legault than Couillard has taken fire from Marois and Legault. 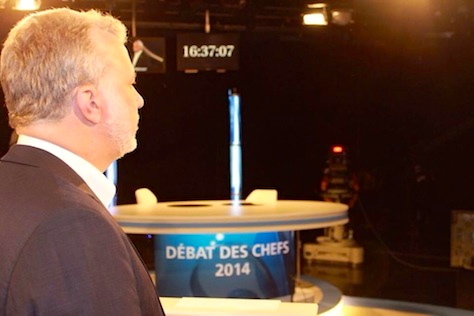 But if anything, Couillard in his first leader’s debate, is keeping a very cool and calm composure. 8:36 pm: Marois largely defends her record on this and on education. Legault accuses the bloated bureaucracy and blames both the PQ and Liberals for that. 8:37 pm: Couillard largely concedes Legault’s point about bureaucracy in both education and health care. 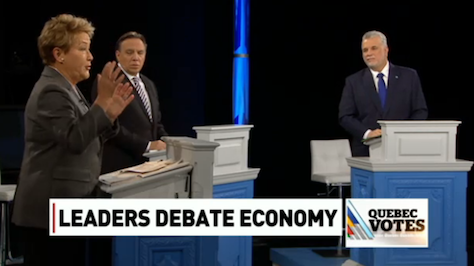 8:38 pm: Couillard poses a question to David about poverty in Québec. This seems like a softball, essentially. 8:41 pm: Couillard, in his question period with David, argues that the private sector creates jobs, not the government. Another clear bid for the hearts and minds of the traditional CAQ voter base. Otherwise, a very calm, academic debate between Couillard and David — and that makes sense, because there are very, very few voters who are trying to decide between the Liberals and Québec solidaire. 8:45 pm: A style point. Marois’s arched eyebrows make her look very harsh when she’s listening to Legault. 8:49 pm: A more civil chat between Legault and Couillard on education, bureaucracy and the role of school boards. Legault, in response, argues that school boards contain too many employees and not enough participation. Couillard attacks Legault for not doing anything about it as minister of education between 1998 and 2002 (when Legault was a PQ leader). 8:51 pm: As the debate continues over health care, one of the moderators notes that three of the leaders have served as minister of health. In fact, Marois served between 1998 and 2001, Legault between 2002 and 2003 and Couillard from 2003 to 2008. 8:54 pm: Couillard turns the question of health care back to the question of deficit reduction — accusing the PQ of cutting $600 million in health care, adding to wait times, etc. 8:56 pm: David argues that health centers should be open 24-7. 8:57 pm: ‘We did correct the problem.’ Marois argues that 60% of family medicine groups have been open expanded hours, improving on the prior Liberal record. She claims that emergency room waits are down one hour, on average, because of the PQ’s support for family medicine groups. 8:58 pm: Legault goes for the kill here, arguing that Marois is apparently satisfied with 40% of family medicine groups being open at just normal hours. Marois actually intervened and said, “60%” before Legault finished his sentence. Marois looks very, very defensive tonight. The debate will focus on four topics: economy, governance, sovereignty and identity. Pauline Marois, the leader of the Parti québécois, the (mostly) center-left, sovereigntist party that currently controls a minority government in the province. Marois called a snap election earlier this month in hopes of winning a majority vote. Philippe Couillard (pictured above), the leader of the (mostly) centrist, federalist Parti libéral du Québec (Liberal Party, or PLQ). Couillard, a former health minister, won the PLQ leadership easily in March 2013, though the Liberals controlled Québec’s government for three consecutive terms under former premier Jean Charest. François Legault, the leader of the center-right, soft sovereigntist Coalition avenir Québec (CAQ), who is struggling to maintain the same level of support as in the previous 2012 campaign. Françoise David, one of two spokespersons for Québec solidaire, a left-wing, sovereigntist party that stands as an alternative to the PQ. Marois, Legault and David were all on the same figurative stage during the 2012 campaign — that makes tonight especially important for Couillard. The recent shift of the campaign’s narrative away from the controversial Charte de la laïcité (Quebec Charter of Values) and the discussion over ‘religious freedom’ and toward the more controversial question of Québec’s independence has galvanized voters, a majority of whom say they don’t want Marois and the PQ to hold another referendum on independence, which could be the province’s third in 35 years — federalists very narrowly won two previous referenda in 1980 and 1995). Liberals would win 37% of the vote today to just 32% for the PQ, 16% for the CAQ and 10% for Québec solidaire. Among Anglophones, the Liberals hold a commanding majority, winning 80% of the vote. Among Francophones, the PQ leads the Liberals by a margin of 38% to 29%, with the CAQ winning 18% and Québec solidaire winning 12%. Stunningly, only 18% of the electorate wants Marois to call an independence referendum if she wins a majority government, while 64% do not. Only 27% of voters would vote for an independent Québec today, while 57% would oppose it and 15% aren’t sure. Just 30% of voters would support a ‘sovereign’ Québec in partnership with the rest of Canada (presumably, sharing malleable borders and the Canadian dollar), while 51% would oppose it, with 19% unsure. Fully 57% of Québec’s voters think the province is on the wrong track, while just 33% believe it is on the right track. Previous PostThree reasons why Petro’s removal as Bogotá mayor could harm SantosNext PostShould Europe be concerned about the threat of Kaliningrad?